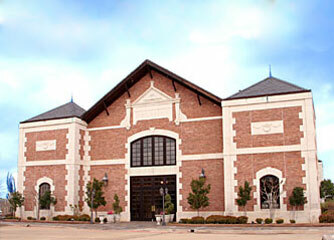 Conveniently located between Dallas and Fort Worth, and minutes from D/FW International Airport, Delaney Vineyards & Winery offers a unique and elegant venue for weddings, corporate events or an afternoon of touring and tasting. The 8,000 square foot Winery is reminiscent of an 18th century French chateau nestled among 10 acres of lush grapevines. The 5,200 square foot Barrel Room is a large, yet intimate space with capacity for 300 guests. The 1,200 square foot Tank Room is available for rental to smaller groups. The 1,000 square foot outdoor Crush Pad offers sweeping views of the vineyard, as well as heaters, fans and screens to adapt to the ever-changing Texas weather. The Delaney retail store sells wine produced from two Delaney vineyards as well as unique wine themed items for gift giving. Delaney Retail Store hours: Monday- Saturday 10am to 5 pm. Public Tours & Tastings : Tuesday-Saturday 12 noon to 5pm Private Tour & Tastings: Large Groups please call for availability Delaney Vineyards & Winery remains the largest vineyard and winery in the Dallas/Fort Worth Metroplex and is an exceptional Texas Wine experience for out-of-town visitors and locals alike. E-mail to:info@delaneyvineyards.com or call 817.481.5668 for additional information.